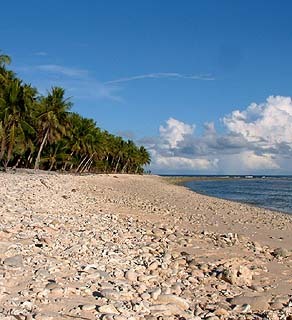 “In Ulithi we just have ‘beach’ in general,” says Mariano, explaining how beaches are identified. “There’s no such thing as ‘Steve’s beach,’ ‘Mariano’s beach.’ Nowadays, the younger generation, they tend to clear the shore part of their land so that they can name it ‘Mariano’s beach.’ This current young generation. But there’s no such thing as so-and-so beach. We just say it, ‘the beach of…’ and then the name of that part of the land." "Here on the island, on Mogmog, all of us are from here, we can just go and get beach sand wherever you want," Hosay says. "Our concrete houses, that’s what we need sand for. "Any valuable thing that’s washed up on the shore, that’s for the chief. But the sand is there for everybody. As for plants, if it’s a coconut tree, and someone says ‘that’s my land,’ then the owner of that land is the owner of that spot. Medicinal plants, anywhere you find it, you can get some piece from it for your medicine." A stretch of beach on Falalop. Click here for a close-up of the beach textures and materials. 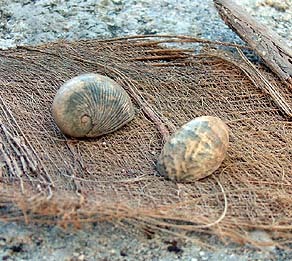 Shells from the type of beach snails Hosay mentions. “People go out at nighttime and they catch a kind of snail shell that they eat the meat inside. There is no problem with gathering those anywhere. And they just crawl around. It’s not a harmful thing. Even the small kids, they just pick them up and put them in a basket. "But if I go to Sohl’oay to collect those, I’m supposed to ask permission before I go get those kinds of shells. These are collected near the beach, and only nighttime. Sometimes daytime you can find them but mostly it’s nighttime that they come up. They are very good, especially when we soup them with coconut milk. Sometimes they just boil it with salt water and leave the meat inside." 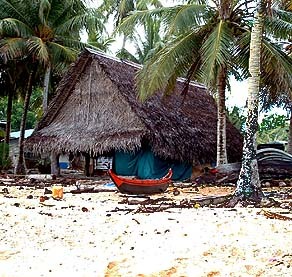 The canoe house (left) and the Men's House on the beach at Mogmog. “In the past, we had canoe houses on the beach,” Barney recalls. “Each clan had their own. There, we made rope and line, making it out of coconut husk. Women were allowed. No. Not during the day time. But at night time…. “The canoe house is entirely different from the Men’s House,” Chief Taithau states. “These were the common activities done in the canoe house: making of rope, and dance practice. The most common activities done in the past, it’s mostly rope-making. People will gather in there and they get all this coconut fiber. Maybe somebody’s pulling the fibers, somebody’s making the smaller strings. Others are making bigger ropes. And it’s stored in there for canoe repairs." “Women could come to the canoe houses. That’s where they weave the sails for the canoes. Each clan has its own canoe house. So if the sail of their canoe needs to be repaired, that’s where all the women gather to weave the sail from pandanus leaves. The Men’s House, it cannot be done there. So that’s the difference between the canoe house and the Men’s House. “What has become a practice nowadays is the men tend to sit under canoe house where it’s nice and breezy, and they make stories. So if you go straight to the Men’s House, they’ll call you, ‘come here and report your trip to here.’ So that is then instead of the Men’s House." Looking through the canoe house on Mogmog. 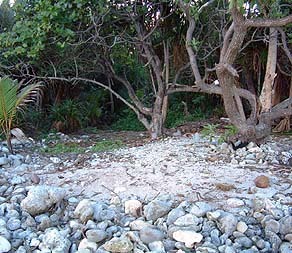 An area like this clearing at the Southeastern end of Falalop, away from the village, would have been used for canoe carving. “Canoe carving was done under temporary sheds set up at the ends of each island. So when the canoe is completed, then they put it in the water. That’s when the canoe is brought to the canoe house. And to prepare for it’s first catch, to be distributed among the clan members of that particular canoe. "Before, yes, so many activities in the canoe house. Nowadays you will find only a few men doing some carving in the canoe house. Mostly each person does his work at home because of the spreading out and scattering of the homes." “When you build a new canoe, you cannot make it in the village," Barney says. "You have to go to the end of island. That’s a taboo. They don’t have any special place, just at the end of island, away from everybody. They would just go down there and do the work, and come back to the village. Mariano adds, "If a house is under construction in the community, then canoes should not be built. If this is so, that person will have to move to another island to make his canoe." “We used to get our canoes from Yap,” Barney continues. “This is because they have more wood on Yap for building canoes. We went there to that village in where we have a connection —sawey—and they give us a big canoe for nothing." The canoe house retains its function despite the shift to boats from canoes. 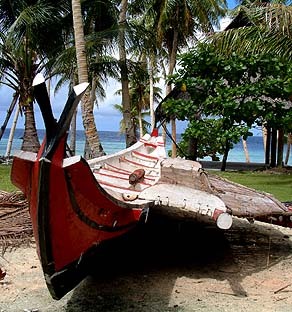 A canoe at the Bechiyal Cultural Center on Yap. Note the two fish traps as well. 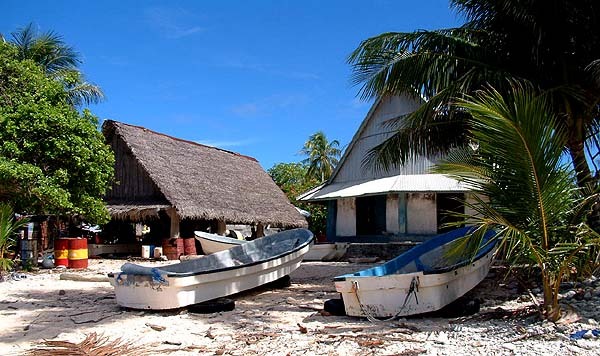 "But we had to travel to Yap every year, filling up the canoes with coconut candy, lavalavas, rope, and taking it there. And they would fill our canoes with food, taro and squash, whatever it is what they have, then we’d come back. “We seldomly carve canoes out here in Ulithi,” Mariano agrees. “You can carve a small canoe, but medium-sized to big canoes—sailing canoes—they are all built in Yap. And they are given out here to the particular clans." "If you want one canoe and you see this canoe in Yap—and you are really after this canoe—you have to talk to the Yapese clan members, your sawey. They’re the ones who will gather whatever money and they go to the owner of that particular canoe. They are the ones to do the arrangement. “Now when the canoe is released to come out here, then every member of your clan here will take part in the contributing to the return, the payment, of the canoe. At one of these tribute trips, the payment goes back to the sawey . "Now if the sawey in the first place had already paid for the entire canoe, then this return payment, he cannot keep those. But if it was partial payment, then he can deal with the owner of the canoe." A lagoon-sized canoe at Falalop. 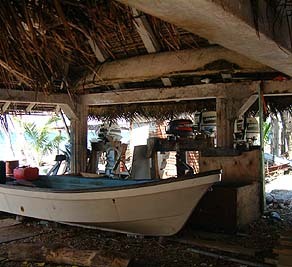 A small paddling canoe sits outside another canoe house on Mogmog. 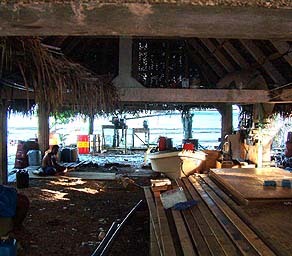 Remains of a much larger canoe lie between the two coconut trees to the right. "We clan members will choose a particular guy to be looking after the canoe all the time, so he’s watching over the canoe for the clan. And he really takes care of the canoe. 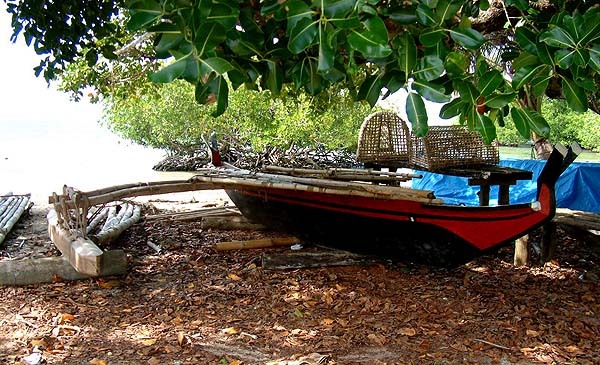 The bows of the canoe, it’s also a type of decoration, so when there is an occasion on each island where all the islanders will gather to that island, that’s when we sit in the men’s house and we watch the canoes. "And each man who looks after a particular canoe, if he’s really proud of this canoe, he tries to anchor it a little bit away from the rest of the canoes. It’s saying, ‘I have a special canoe here.’ Even sailing, sometimes they tie up decorations. These fibers – they dye it different colors, so when they sail, it’s like they decorate their canoes." Canoe carving: Daniel Dig, Ulithi's last canoe carver, discusses canoe construction. Equipment: Steve Tilwemal explains some of the parts and equipment on the canoe. 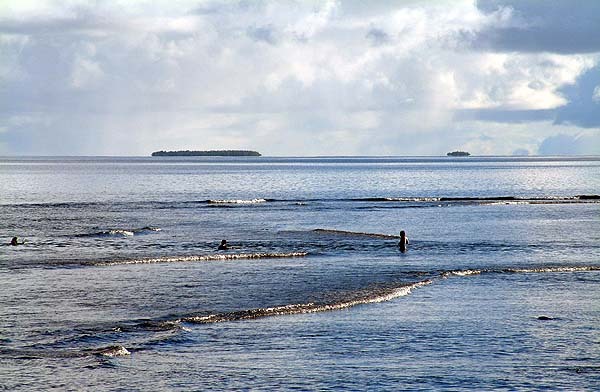 The beach and its roles are intimately connected with activities on the reef.